Solar still delivers a 12% plus tax free return and provides the best way to insulate against future electricity price rises – call now to find out more. Solar PVE have installed many 100’s of PV systems on domestic properties throughout the South West and Midlands. As part of the Solar Technology International group, who are one of the UK’s largest and longest established manufacturers of solar panels and associated equipment, we have in house expertise far beyond what a straight forward installer can offer. At PVE we understand that customers want the best performance and best value but we also know that the appearance and finish of the system is of great importance. A lop sided solar array, messy cabling and badly fitted inverters and switch gear are occurrences we here about and see all too often. This does not happen at PVE! Our surveyors takes great care to agree the location of equipment and cable runs with customers before the install team arrives. This process ensures that there can be no misunderstanding when it comes to installations. PVE’s guarantees are rock solid! Solar PV equipment comes with long warranties but since the end of 2011 there have been many solar installers who have sadly closed their doors. What value is a long term warranty then? At PVE, we are backed by the Solar Technology International Group and you can be assured of the financial stability of our company so that if there are problems with an installation, one phone call will ensure an engineer is on site within 5 working days – typically much sooner! PVE’s guarantees are rock solid! Solar PV equipment comes with long warranties but since the end of 2011 there have been many solar installers who have sadly closed their doors. What value is a long term warranty then? At PVE, we are backed by the Solar Technology International Group and you can be assured of the financial stability of our company so that if there are problems with an installation, one phone call will ensure an engineer is on site within 5 working days – typically much sooner! We do not employ sales people. We do not use pressure sales tactics and we dont have any painfully transparent “special offers” to entice customers to sign up on the spot. When our surveyor makes an initial visit he will assess the property for its suitability for PV and will answer any questions. A quote will then be posted that includes the full cost (there are no extras & no options with our cost – it includes everything) and the quote will include the predicted yield the solar system will deliver, thus customers know in advance what the benefit will be in monetary and carbon reduction terms before they commit. 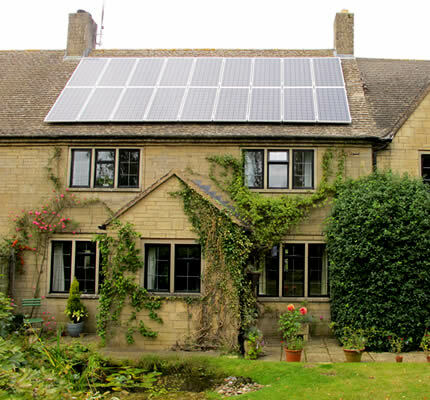 As a guide, a typical 3.9Kw solar system fitted to a 2 storey house will cost in the region of £6,499 inc VAT and will deliver cash and energy savings benefits of over £25,000 during the 20 year period of the Feed in Tariff. Naturally, we appreciate that many new customers sensibly ask for a references. We have many customer testimonials than can be seen. We also have an extensive register of referee’s so that we can put potential customers directly in touch with existing customers to have a one to one chat about us, our products and the service we provide. Not many solar installers are willing to do that! Please call 01684 774006 or email info@solarpve.co.uk for more information or to book a free, no obligation solar assessment.